This photo was taken this season in Walnut, Calif., during the Corps at the Crest Show. In attendance were many Pacific Crest alums and during intermission we were able to hug and reminisce, while feeling sorry that we had to watch instead of perform. Some of us horn line girls posed for a quick photo in the beautiful California weather. 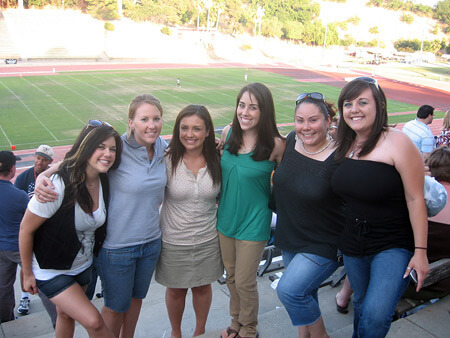 In this photo (from left): Jessica V. (mellophone, '06), Jessica L. (mellophone, '05-'07), Denia (trumpet, '05), Emily (mellophone, '05-07), Erika (trumpet, '05), and Melania (mellophone, '04-06). It was a great night for drum corps!